Who says fashionistas can't enjoy delicious food? Jessica Milan, a model-turned-photographer and health-conscious foodie, brings you a lookbook of unique style and a cookbook of tasty vegan and gluten-free meals. Flip through and you will find super simple recipes for smoothies, apps, snacks, mains and treats paired with photos of real girls indulging in the finished products. You will love looking through the photos as much as you enjoy preparing and eating these amazing recipes, like Tex-Mex Potato Skins, Veggie Pad Thai, Quinoa Yam Patties and Sun-Dried Tomato Pasta Pesto. All of the recipes are vegan and completely soy- and gluten-free, using only fresh, all natural, good-for-the-body-and-the-mind ingredients, so you can savor every bite with no guilt. The heart of Lookbook Cookbook is in the clean, delicious and easy-to-make recipes, but also the soul is in its message: all girls deserve to have their pancakes and eat them too. So, whether you follow a strict vegan, vegetarian or gluten-free diet, or you simply want to incorporate more healthy meals into your week, Lookbook Cookbook is your must-have source of inspiration! 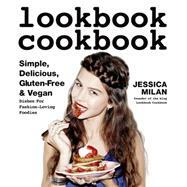 Jessica Milan is the creator of LookbookCookbook.com. Her recipes and photography have been featured in Cosmopolitan, Vogue, Nylon, Marie Claire and Glamour, and on AmericanApparel.com, UrbanOutfitters.com and Refinery29.com. Jessica lives in Utopia, Ontario, Canada.